Eero Saarinen. Courtesy of the National Park Service. 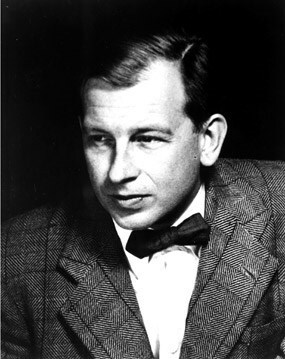 Eero Saarinen was born in Finland in 1910 the son of Eliel Saarinen, a noted and respected architect. His mother, Loja Saarinen, was a gifted weaver, photographer, sculptor and architectural model maker. Eero household was filled with drawings and paintings and they were taken very seriously; at an early age devotion to quality and professionalism were instilled in him. In 1923 Eero’s family immigrated to the United States and settled in Michigan just north of Detroit, where Eliel administered the Cranbrook Institute of Architecture and Design. Eero studied at the Yale School of Architecture between 1930 and 1934. He returned to Cranbrook in 1936 to become an instructor of design and his father's partner in the architectural firm. During this period he began to build a reputation as an architect who refused to be restrained by any preconceived ideas. Working with his father on numerous projects, Eero Saarinen had the opportunity to express his own philosophy when he had a chance to enter the 1947 architectural competition for Jefferson National Expansion Memorial. This was his first chance to establish himself as an independent architect. He set out to design a monument not only to Thomas Jefferson and the nation but also to the modern age. 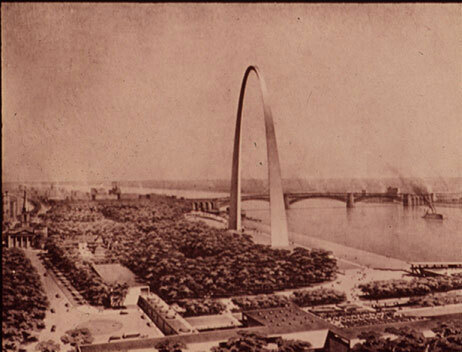 For him, "The major concern...was to create a monument which would have lasting significance and would be a landmark of our time...after looking at all shapes and designs Eero believed an arch would be the perfect match at the edge of the Mississippi River, a great arch. He studied the surroundings of the proposed site to ensure that the design encompassed the entire environment. The Arch was to rise impressively from a small forest set on the edge of the great river. Saarinen thought it would be perfect in its form and its symbolism. Presentation painting entry 144 by Eero Saarinen. Courtesy of the National Park Service. This was Saarinen's first great triumph, but there would be many more. Eero other successful projects such as the General Motors Technical Center, TWA Terminal in New York City, and Dulles International Airport established him as one of the most successful and creative architects of his time. Eero Saarinen was a man of vision and his designs proved that. In 1961 at the age of 51, Eero died of a brain tumor and is buried in Michigan. His vision lives on through the structures that he created. The Gateway Arch was the beginning of his career just as the "Gateway to the West" was the beginning of a new life for countless pioneers.